American test pilot astronaut 1962-1970. Member of first crew to rendezvous in space, and first to orbit the moon. Status: Inactive; Active 1962-1970. Born: 1928-03-14. Spaceflights: 2 . Total time in space: 19.90 days. Birth Place: Gary, Indiana. A hero of the American Space Odyssey, Frank Borman led the first team of American astronauts to circle the moon, extending man's horizons into space. He is internationally known as Commander of the 1968 Apollo 8 Mission. A romance with airplanes that began when he was 15 years old, took Frank Borman to the Air Force and then to NASA. A career Air Force officer from 1950, his assignments included service as a fighter pilot, an operational pilot and instructor, an experimental test pilot and an assistant professor of Thermodynamics and Fluid Mechanics at West Point. When selected by NASA, Frank Borman was instructor at the Aerospace Research Pilot School at Edwards AFB, California. In 1967 he served as a member of the Apollo 204 Fire Investigation Board, investigating the causes of the fire which killed three astronauts aboard an Apollo spacecraft, reminiscent of the Challenger tragedy. Later he became the Apollo Program Resident Manager, heading the team that re-engineered the Apollo spacecraft. He also served as Field Director of NASA's Space Station Task Force. Frank Borman retired from the air Force in 1970, but is well remembered as a part of this nation's history, a pioneer in the exploration of space and a veteran of both the Gemini 7, 1965 Space Orbital Rendezvous with Gemini 6 and the first manned lunar orbital mission, Apollo 8, in 1968. Borman's retirement from the Air Force in 1970 did not end his aviation career. He became a special advisor to Eastern Airlines in early 1969 and in December 1970 was named Sr. Vice President-Operations Group. He was promoted to Executive Vice President-Genera Operations Manager and was elected to Eastern's Board of Directors in July 1974. In May 1975 he was elected President and Chief Operating Officer. He was named Chief Executive Officer in December 1975 and became Chairman of the Board in December 1976. During his tenure as Chief Executive Officer of Eastern, the airline industry went through an enormous change caused by deregulation. During this period Eastern originated several unique programs including profit sharing and wages tied to company profitability. These programs produced the four most profitable years in the company's history. A recalcitrant union forced their abandonment in 1983 and the resulting loses led to the sale of the airline to Texas Air Corporation. Colonel Borman retired from Eastern Airlines in June of 1986. Colonel Borman was privileged to serve as Special Presidential Ambassador on trips throughout the Far East and Europe, including a worldwide tour to seek support for the release of American Prisoners of war held by North Vietnam. He received the Congressional Space Medal of Honor from the President of the United States. Colonel Borman also was awarded the Harmon International Aviation Trophy, the Robert J. Collier Trophy, the Tony Jannus Award and the National Geographic Society's Hubbard Medal--in addition to many honorary degrees, special honors and service decorations. More recently, in September of 1990, Colonel Borman along with fellow Apollo 8 astronauts, Lovell and Anders, was inducted into the International Aerospace Hall of Fame. And in October of 1990 received the Airport Operators Council International Downes Award. In March 1993, he was inducted into the U.S. Astronaut Hall of Fame. Frank Borman was born in Gary, Indiana, and was raised in Tucson, Arizona. He earned a Bachelor of Science degree from the U.S. Military Academy, West Point, in 1950 and a Master of Science degree in Aeronautical Engineering from the California Institute of Technology in 1957. He completed the Harvard Business School's Advanced Management Program in 1970. Frank Borman is currently a member of the Board of Directors of the Home Depot, National Geographic, Outboard Marine Corporation, Auto Finance Group, Thermo Instrument Systems and American Superconductor. He was named Chief Executive Office of Patlex Corporation in the spring of 1988, and presently holds the titles of Chairman, CEO and President of that Corporation. He has written an autobiography entitled Countdown: An Autobiography of Frank Borman with Robert J. Serling, released October of 1988 and published by Silver Arrow Books, William Morrow and Company, Inc. He is married to the former Susan Bugbee of Tucson, Arizona. They have two sons, Frederick and Edwin, and four grandchildren. Frank and Susan presently reside in Las Cruces, New Mexico. BIRTHPLACE AND DATE: Borman was born in Gary, Indiana, on March 14, 1928. EDUCATION: Borman received a Bachelor of Science degree from the U.S. Military Academy, West Point, in 1950 and a Master of Science degree from the California Institute of Technology in 1957. He completed the Harvard Business School's Advanced Management Program in 1970. EXPERIENCE: Borman was a career Air Force office from 1950 to 1970, when he retired with the rank of colonel. He served as a fighter pilot in the Philippines, as an operational pilot and instructor with various squadrons in the United States, as an assistant professor of thermodynamics and fluid dynamics at West Point and as an experimental test pilot at the USAF Aerospace Pilot School. NASA selected him as an astronaut in 1962. In December 1965, he and Jim Lovell spent a record 14 days in orbit aboard Gemini 7. During the flight, Gemini 6 astronauts Wally Schirra and Tom Stafford were launched and executed the first space rendezvous, with the two spacecraft manoeuvring to less than a metre of one another. After being assigned Apollo 8, Deke Slayton offered Borman and his crew the first Lunar Landing, instead of Armstrong and Aldrin, but Borman turned him down. A last minute decision was made to send Apollo 8, only the second manned Apollo flight, into lunar orbit in order to beat the Russians. On December 21, 1968, the Apollo 8 crew of Borman, Lovell, and Anders became the first humans to reach escape velocity as their Saturn V put them on a trans-lunar trajectory. Early on Christmas Eve, the Apollo 8 command-service module braked into lunar orbit. In an unforgettable Christmas message to the world, Borman, Lovell and Anders read the story of creation from the first ten verses of the Bible's Book of Genesis, while sending a vivid televised image of the stark lunar surface rolling by below. On Christmas Day, Apollo 8's engines pushed the crew out of lunar orbit and back toward Earth to a landing in the Pacific Ocean. After the flight Borman left NASA and the Air Force for an equally successful and much more lucrative career in business. From 1969 he served Eastern Airlines as a special adviser, and a year later he was named Vice President-Operations Group. He worked his way up the corporate ladder and by 1975 was President and Chief Operating Officer, becoming Chief Executive Officer later that year, and Chairman of the Board in 1976. He resigned from Eastern in 1986. Later he was an official of the Patlex Corporation. Family: Astronaut. Country: USA. Spacecraft: Gemini. Flights: Gemini 4, Gemini 7, Apollo 205, Apollo 503, Apollo 8. Projects: Apollo. Agency: USAF. Bibliography: 5188. 1928 March 14 - . Birth of Frank Frederick II Borman - . Nation: USA. Related Persons: Borman. American test pilot astronaut 1962-1970. Member of first crew to rendezvous in space, and first to orbit the moon. 2 spaceflights, 19.9 days in space. Flew to orbit on Gemini 7 (1965), Apollo 8..
1965 December 18 - . 1967 April 27 - . NASA Task Team - Block II Apollo CSM Redefinition - . Nation: USA. Related Persons: Borman. Program: Apollo. Spacecraft: Apollo CSM, CSM Block II. NASA Task Team - Block II Redefinition, CSM, was established by ASPO. The team - to be in residence at North American Aviation during the redefinition period - was to provide timely response to questions and inputs on detail design, overall quality and reliability, test and checkout, baseline conditions, configuration control, and schedules. 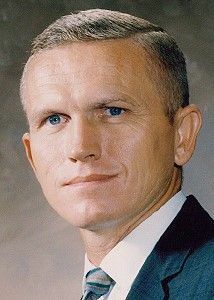 Astronaut Frank Borman was named Task Team Manager and group leaders were: Design, Aaron Cohen; Quality and Reliability and Test and Checkout Procedures, Scott H. Simpkinson; Materials, Jerry W. Craig; Specifications and Configuration Control, Richard E. Lindeman; and Scheduling, Douglas R. Broome. Apollo 503 (cancelled) - . Crew: Anders, Borman, Collins. Backup Crew: Conrad, Gordon, Williams, Clifton. Nation: USA. Program: Apollo. Flight: Apollo 503. Spacecraft: Apollo CSM. The third Apollo flight announced on December 22, 1966, was the Apollo E mission - a test of the Apollo lunar module in high earth orbit. In order to beat the Russians around the moon, it was decided that the E mission would be cancelled and instead Borman's crew would fly an Apollo CSM into lunar orbit. This became Apollo 8. 1968 August 13 - . Launch Vehicle: Saturn V.
Borman crew selected for Apollo 8 lunar mission. - . Nation: USA. Related Persons: Borman, Low, George. Program: Apollo. Flight: Apollo 8, Apollo 9. Spacecraft: Apollo CSM. Kleinknecht had concluded his CSM 103-106 configuration study by August 13 and determined the high-gain antenna was the most critical item. Kraft was still "GO" and said December 20-26 (except December 25) offered best launch times; he had also looked at January launch possibilities. Slayton had decided to assign the 104 crew to the mission. He had talked to crew commander Frank Borman and Borman was interested. 1968 August 19 - . Launch Vehicle: Saturn V.
Changes in planning for Apollo flights - . Nation: USA. Related Persons: Anders, Borman, Lovell. Program: Apollo. Flight: Apollo 8. Spacecraft: Apollo LM, Apollo Lunar Landing, CSM SPS. Assignment of Saturn V 503, CSM 103, and LM-3 to Mission D was canceled. Saturn V 503 would be prepared to carry CSM 103 and LTA (LM test article)-B on a manned CSM-only mission to be designated the C prime mission. The objectives and profile of the C prime mission would be developed to provide maximum gain consistent with standing flight safety requirements. Studies would be carried out and plans prepared so as to provide reasonable flexibility in establishing final mission objectives. All planning and preparations for the C prime mission would proceed toward launch readiness on December 6, 1968. Saturn V 504, CSM 104, and LM-3 were assigned to the D mission, scheduled for launch readiness no earlier than February 20, 1969. The crew assigned to the D mission would remain assigned to that mission. The crew assigned to the E mission (Frank Borman, James A. Lovell, Jr., and William Anders) would be reassigned to the C prime mission. Training and equipping the C prime crews and operational preparations would proceed as required to meet mission requirements and to meet the newly established flight readiness date. 1968 December 21 - . 12:51 GMT - . Launch Site: Cape Canaveral. Launch Complex: Cape Canaveral LC39A. Launch Platform: LUT1. Launch Vehicle: Saturn V.
Apollo 8 - . Call Sign: Apollo 8. Crew: Anders, Borman, Lovell. Backup Crew: Aldrin, Armstrong, Haise. Payload: Apollo CSM 103 / LTA-B / S-IVB-503N. Mass: 28,833 kg (63,565 lb). Nation: USA. Agency: NASA Houston. Program: Apollo. Class: Moon. Type: Manned lunar spacecraft. Flight: Apollo 8. Spacecraft: Apollo CSM. Duration: 6.13 days. Decay Date: 1968-12-27 . USAF Sat Cat: 3626 . COSPAR: 1968-118A. Apogee: 185 km (114 mi). Perigee: 185 km (114 mi). Inclination: 32.50 deg. Period: 88.19 min. Apollo 8 (AS-503) was launched from KSC Launch Complex 39, Pad A, at 7:51 a.m. EST Dec. 21 on a Saturn V booster. The spacecraft crew was made up of Frank Borman, James A. Lovell, Jr., and William A. Anders. Apollo 8 was the first spacecraft to be launched by a Saturn V with a crew on board, and that crew became the first men to fly around the moon. All launch and boost phases were normal and the spacecraft with the S-IVB stage was inserted into an earth-parking orbit of 190.6 by 183.2 kilometers above the earth. After post-insertion checkout of spacecraft systems, the S-IVB stage was reignited and burned 5 minutes 9 seconds to place the spacecraft and stage in a trajectory toward the moon - and the Apollo 8 crew became the first men to leave the earth's gravitational field. The spacecraft separated from the S-IVB 3 hours 20 minutes after launch and made two separation maneuvers using the SM's reaction control system. Eleven hours after liftoff, the first midcourse correction increased velocity by 26.4 kilometers per hour. The coast phase was devoted to navigation sightings, two television transmissions, and system checks. The second midcourse correction, about 61 hours into the flight, changed velocity by 1.5 kilometers per hour. The 4-minute 15-second lunar-orbit-insertion maneuver was made 69 hours after launch, placing the spacecraft in an initial lunar orbit of 310.6 by 111.2 kilometers from the moon's surface - later circularized to 112.4 by 110.6 kilometers. During the lunar coast phase the crew made numerous landing-site and landmark sightings, took lunar photos, and prepared for the later maneuver to enter the trajectory back to the earth. On the fourth day, Christmas Eve, communications were interrupted as Apollo 8 passed behind the moon, and the astronauts became the first men to see the moon's far side. Later that day , during the evening hours in the United States, the crew read the first 10 verses of Genesis on television to earth and wished viewers "goodnight, good luck, a Merry Christmas and God bless all of you - all of you on the good earth." Subsequently, TV Guide for May 10-16, 1969, claimed that one out of every four persons on earth - nearly 1 billion people in 64 countries - heard the astronauts' reading and greeting, either on radio or on TV; and delayed broadcasts that same day reached 30 additional countries. On Christmas Day, while the spacecraft was completing its 10th revolution of the moon, the service propulsion system engine was fired for three minutes 24 seconds, increasing the velocity by 3,875 km per hr and propelling Apollo 8 back toward the earth, after 20 hours 11 minutes in lunar orbit. More television was sent to earth on the way back. 1968 December 27 - . Landing of Apollo 8 - . Return Crew: Anders, Borman, Lovell. Nation: USA. Related Persons: Anders, Borman, Lovell. Program: Apollo. Flight: Apollo 8. On the sixth day, the crew prepared for reentry and the SM separated from the CM on schedule. Parachute deployment and other re-entry events were normal. The Apollo 8 CM splashed down in the Pacific, apex down, at 15:51 GMT - 147 hours and 42 seconds after liftoff. As planned, helicopters and aircraft hovered over the spacecraft and pararescue personnel were not deployed until local sunrise, 50 minutes after splashdown. The crew was picked up and reached the recovery ship U.S.S. Yorktown at 17:20 GMT. All mission objectives and detailed test objectives were achieved, as well as five that were not originally planned. The crew was in excellent condition, and another major step toward the first lunar landing had been accomplished. 1969 June 7 - . Borman to visit USSR - . Nation: Russia. Related Persons: Borman. Kamanin is advised that US astronaut Borman will arrive in Moscow in July, and he is to put together a program for him. Kamanin notes it has been difficult for the cosmonauts to appear in public - citizens pester them with unanswerable questions about the status of the Soviet moon landing program. 1969 June 19 - . Plans are made for Borman's visit to the USSR on 1 to 10 July. - . Nation: Russia. Related Persons: Borman. He is to visit cosmonauts and journalists, and visit Leningrad, Moscow, and the Crimea. The only space-related facilities he is to be shown will be the living quarters at Star City and the tracking station at Yevpatoriya..
1969 July 1 - . Borman arrival in Russia delayed - . Nation: Russia. Related Persons: Borman. Borman was to arrive with his wife and two sons (ages 15 and 17). There is lots of high-level interest in the visit and meetings. They are unsure -- is Borman just a visiting astronaut or an official representative of the American aggressors? Borman's plane makes an emergency landing in Canada when an engine fails en route. His late arrival wrecks Kamanin's carefully-laid out schedule for his trip. Kamanin notes that in June 1968 the VVS suffered four times the accident rate as a year earlier. Two An-12's, one An-12 and an Il-14, and two Tu-22's were lost in three midair collisions, costing 131 lives. 1969 July 2 - . Borman arrives in USSR - . Nation: Russia. Related Persons: Borman, Feoktistov, Shatalov, Titov. Borman arrives from Canada at 04:40 after further delay. His wife is worried that the weather in Novosibirsk might be called (it's 32 deg C there!). By 11:00 they are already packed onto a Tu-124 bound for Leningrad together with Feoktistov, Titov and his wife, Shatalov, and 30 foreign correspondents. There are hardly any Soviet correspondents - the government has ordered them not to cover the visit. 1969 July 3 - . Grechko has agreed to the selection of 30 new cosmonauts - . Nation: Russia. Related Persons: Borman, Grechko, Andrei, Titov. Titov test flew a MiG-21. Borman visit is continuing according to plan..
1969 July 5 - . Borman tours the officer's quarters at the Gagarin Centre. - . Nation: Russia. Related Persons: Beregovoi, Borman, Popovich, Shatalov, Tereshkova, Titov, Volynov. Flight: Apollo 8, Soyuz 4/5. On the key day of his visit to Russia, Tereshkova shows Mrs Borman around, while Shatalov accompanies Mr Borman. Borman shows the cosmonauts a film on his Apollo 8 mission and answers questions. Then the Soviets show him exce3rpts from the films 'Road to Space' (on the Gagarin mission) and 'Four in Space' (on the Soyuz 4/5 mission). Beregovoi gives the Bormans a model of the Vostok, Popovich a photo album, and Titov guides them through the museum. In the evening twenty attend a dinner where toasts are exchanged in the Russian manner. Borman and Volynov exchange wristwatches. Borman presented Titov with the watch he received from President Johnson after the Gemini 7 mission - it is to be put in the museum. Eight hours are spent in total at Star City. Kamanin finds Borman to be disciplined and precise. He is at the same time a skilled orator, diplomat, and born politician. 1970 August 10 - . Vacations in Russia. - . Nation: Russia. Related Persons: Borman, Kutakhov. Kutakhov returns from Egypt. Borman will visit the USSR again tomorrow. Afterwards Kamnin will head for a holiday at the spa at Chemitokvadze in the Kavkaz region..